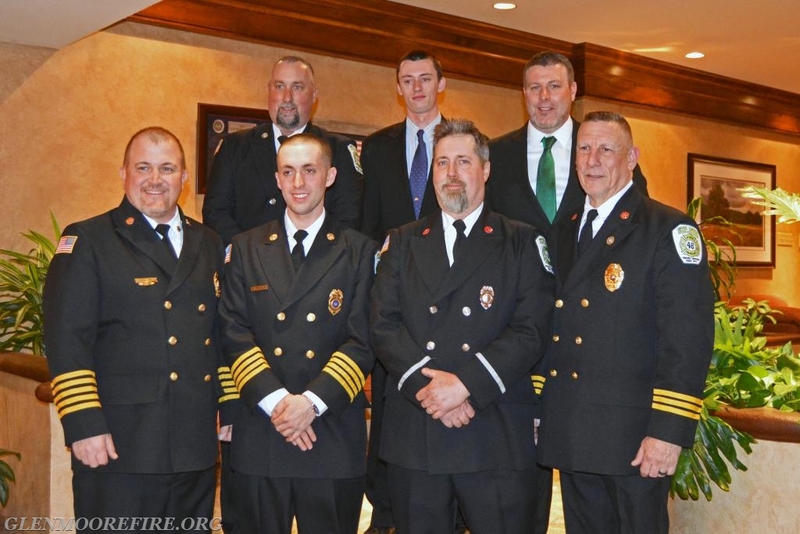 On Saturday, April 7th, the Glen Moore Fire Company held its annual recognition banquet. Each year GMFC recognizes the membership and their families for their commitment and service for the previous year with an annual banquet. This year's banquet was held at the Hershey's Mill Golf Club. During the banquet, several members were recognized for their service and dedication to the fire company. Mike King, Past Fire Chief 2015 - 2017, presented both the Junior Firefighter of the Year Award and the Firefighter of the Year Award. The Junior Firefighter of the Year Award was presented to Samantha “Sam” Camp. Sam is in the 11th grade at the rigorous Downingtown STEM Academy; however, she found time to complete Emergency Medical Technician (EMT) training and became a PA DOH certified EMT. She is looked up to as a leader by her fellow junior members and has shown a dedication to the fire company. The Firefighter of the Year Award was presented to Anthony “Tony” Bocchicchio. Tony has been a member of the fire company for five years. In addition to attending the weekly trainings, he also attended several outside trainings during the year. In 2017, he achieved ProBoard Certification at the Firefighter II level and PA DOH certification as a Special Vehicle Rescue Technician. Tony also completed Pump Operations I and II training in preparation for becoming a driver. Current Fire Chief Jeff Seese then presented a special award to Mike King for his years of service as the company’s Fire Chief. Mike served as the Fire Chief from 2015 – 2017 and was responsible for boosting the membership of the fire company by leading a successful recruitment campaign. Mike has been a member of the fire company for 7 years and has demonstrated his dedication to the fire company by being the top responder year in and year out. His leadership over the past 3 years has laid the foundation for the fire company as we grow and expand. Thank you for all your hard work and service. 20 years of service – Scott Welker and Mary Trego. Both Scott and Mary were also awarded the designation of Life Members for serving 20 years. Congratulations to all those who were recognized at this year’s banquet and the entire membership for their hard work and dedication to the community in 2017. Thank you to the Honey Brook Fire Company for covering our first due during the banquet and a very big THANK YOU to Desiree Seese for putting together another wonderful event. Chaplain Matthew York saying the prayer. President Jeff Camp addressing the attendees. Past Chief Mike King being honored for his service. Current Fire Chief Jeff Seese and Secretary Desiree Seese passing out awards. Tony Bocchicchio (with Mike King) after being named Firefighter of the Year for 2017.